Really? 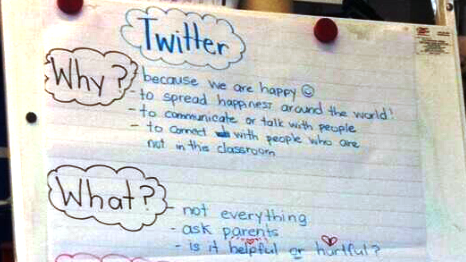 Twitter with Kindergarten students? That was my first reaction. While I think Twitter is a great way to connect and share ideas, I didn’t really see it as a tool for our youngest learners. So, I have learned something. This tweet is a great example of why all superintendents need to be on Twitter. It is such a great way to see a sampling of the work going on in the district. It is such a wonderful way to ‘drop in’ on the learning in various classrooms and schools across the district. 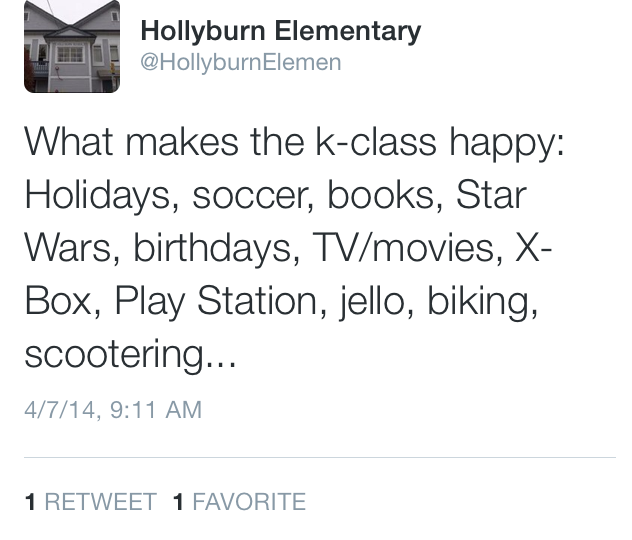 It was this tweet that led me to be in the class three days later — a great way to take advantage of our connected world. So, back to my reservations. When I first heard a kindergarten class was tweeting, my mind jumped to all that could go wrong instead of all that could go right. In a controlled environment, guided by the teacher, these young students are learning about digital literacy. Their parents, many who are also new to social media, engage with them in the class and the students can connect to the world! When I visited the class earlier this week, I learned of parents that were now following the class, and a great home / school connection. It was wonderful to learn with the K students about their Happiness Project and how they were sharing it through Twitter with the world. On day two of the project, the lessons were already very impressive. The students were completely engaged in their Happiness Project, and the use of Twitter was part of the hook and a great introduction to social media. If we want students to engage ethically with social tools, we need to teach and model and that is just what I saw happening in the classroom. I look forward to virtually following the Hollyburn Happiness Project and the many other classes and schools sharing their learning beyond the classroom walls through Twitter with a range of other social tools. The Hollyburn story is another fine example of a teacher taking a risk and being a learner herself! It is always great to see what is happening in our classrooms. Follow us too! @kindercrush. Caulfeild Kindergarten. Thanks Andrea – great to see what you are doing as well! Twitter in K in booming! So cool…. parents must LOVE this!! Yes, absolutely – they love what their kids are learning and how they are connected. Enjoyable read! Congratulations to the public educators in West Vancouver – kudos to the innovative teacher understanding the importance of using technology such as Tweeter and then creating such a developmentally appropriate activity for kindergartens and to Chris Kennedy for getting into the classrooms and seeing first-hand such excellent teaching and evidence of his vision for the district. It’s so great that you took the time to be with them, Chris – they were beaming about their Happiness project! 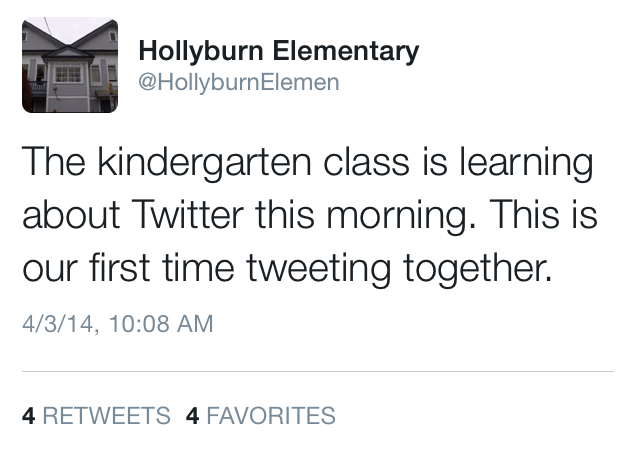 I wonder if there are other classes in our district using Twitter? 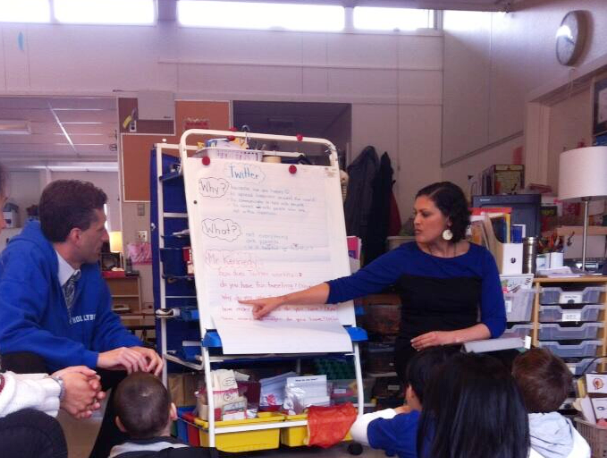 Hi – since posting, I have learned about the K class at Caulfeild also using twitter. There is also a foods class at West Van Secondary that regularly posts. In addition, a number of teachers are also posting from their class – it does seem we have a growing use of twitter in the district. What a great story on so many levels! After I read this post I went to Tara’s blog and was really impressed. Thanks Sheelah – it is so wonderful how the little things can make such a difference. We are blessed with so many wonderful teachers! Interesting! I love your sentence “my mind jumped to all that could go wrong, instead of all that could go right” – an obstacle we all need to outcome in regards to technology. Thanks! Thanks Helen. It is a view that we should always be moving towards but it is so easy to look at what can go wrong.